Attention: the product is designed for work on netting accounts only. The product is designed for copying trades only within a single computer or VPS with access to the desktop. The product will not work on the built-in Virtual Hosting of the terminal. On the provider's account, run Copier TRF from folder "Experts\Market". The product works on any chart. Select Master mode. Select necessary parameters. If prefixes or suffixes are used in symbol names on the master account, they should be indicated in parameters mPrefix and mSuffix. Set the period of master account data update in parameter "sleep". The number of milliseconds. On the client's account, run Copier TRF from folder "Experts\Market". The product works on any chart. Select Slave or Slave_reverse mode. If prefixes or suffixes are used in symbol names on the slave account, they should be indicated in parameters sPrefix and sSuffix. 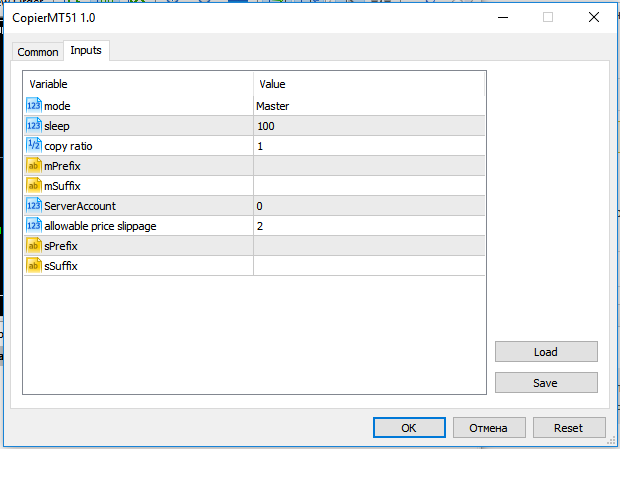 In the ServerAccount parameter, specify the number of the master account where the trade copier is running in master mode, or leave the ServerAccount unchanged. After start, in the top left corner of the chart, click the required master account number, where the trade copier is running. Set other parameters at your own discretion. Master - for the provider account; in this mode, the script transmits trades from the master account. Slave - for the receiver account; in this mode, the script receives the data transmitted by the script from the master account. Slave_reverse - for the receiver account; in this mode, the script receives the data transmitted by the script from the master account and reverses the trade's direction. In other words, if BUY is opened on the master account, SELL is opened on the client. Sleep - data file update/check period in milliseconds. copy ratio - lot copying ratio. mPrefix - prefix in symbol names on the master account. Leave blank if no prefix is used. mSuffix - suffix in symbol names on the master account. Leave blank if no suffix is used. ServerAccount - number of the master account to copy trades from. If 0, then you need to select the account number from the list in the upper left corner immediately after starting the copyer. allowable price slippage - maximum price slippage set when sending an order by the copier. sPrefix - prefix in symbol names on the slave account. Leave blank if no prefix is used. sSuffix - suffix in symbol names on the slave account. Leave blank if no suffix is used. Fixed the spontaneous closure of deals on the slave account in case of a disconnection from the master account.